Tablet manufacturers are forever touting their creations as “laptop replacements” but all that really tells me is that they don’t understand how I use my laptop. Two differentiating factors stand out above all others where I’m concerned; a keyboard suitable for touch-typing, and the ability to plan routes for use with my GPS. The first point looks like it may have been eliminated with the purchase of a Bluetooth keyboard that actually works, if you can get your fingers used to the dividing trench down the middle and your eyes used to the Microsoft logo on the front. Of course I jest. It really is very good indeed and lets you switch between devices and operating systems via a dedicated key, lasts for months on a single charge via the ubiquitous micro USB port, and magnets hold its splash-proof design neatly folded in half when not in use, taking up about as much room as a CD case. 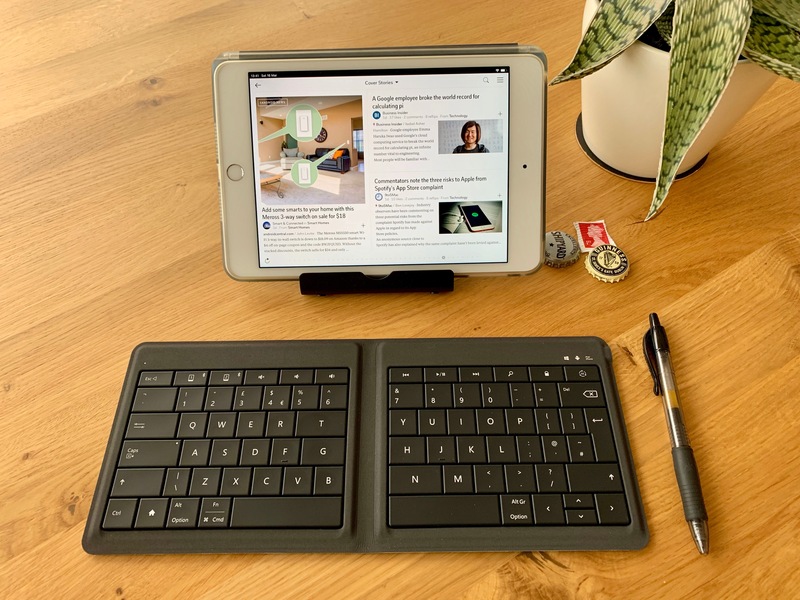 I’m typing this post on it right now, and although it’s not 100% as good as a laptop keyboard it comes closer than you’d believe possible given the price. The only fly in the ointment – and it’s a small fly – is that the odd key spacing / size necessary to facilitate a neat fold takes some getting used to, and to begin with you sometimes hit the wrong key. Nut I can live with that. The second point is trickier. 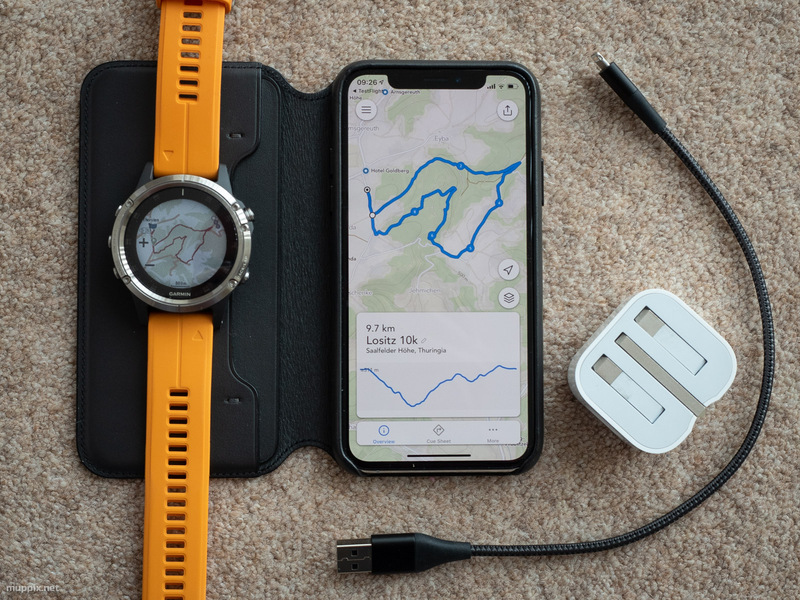 I’m a heavy user of Garmin devices, and often plan walks, runs, or multi-day road trips by plotting courses on digital maps and then transferring them to a range of gadgets. Occasionally I download the track logs after an activity, storing them for posterity so that I can see which parts of a region I’ve yet to explore, or for geotagging photos taken along the way. I do all this using a piece of software called Basecamp (or MapSource, if you’re old enough to remember floppy disks) and unfortunately that only runs on MacOS or Windows. Which means bringing a laptop along. In a protective sleeve. And a laptop charger. And some USB cables. All of which is a right nuisance when you’re on the kind of trip that can be spoilt by carrying too much gear. When I think back over the last couple of years, all those “lightweight” excursions which saw me dragging a laptop along did so because I needed a keyboard and Basecamp, whether it was cycling to Paris on my Brompton or off-road riding in the Ligurian Sea Alps on my GS. Some of that’s about to change. I’ve arrived at a workflow that lets me plan a walk or a run, check the distance and elevation profile, and transfer the route to my Garmin Fenix 5 Plus, where I can then check my progress and even navigate just by raising my wrist. You’re probably thinking that doesn’t sound like a huge leap forward, that this kind of basic functionality should be built-in when you buy a high-end fitness device. Technically it is, however anyone who owns a Garmin will tell you that software isn’t the company’s strong point, and that the physical attributes which make their devices so eminently useable in their native environments also make them frustratingly awkward when it comes to planning routes. Yes, you can ask your Fenix to plan you a run or a ride for X miles and even tell it which way you want to go, and yes it can draw upon crowd-sourced data to show you popular routes, but that data doesn’t take into consideration seasonality, and you may find that your alpine trail run is completely frozen over in winter, and that the back-up route is closed to pedestrians because in December they use it for Nordic skiing. A Garmin fitness device with mapping and online capability. I’m using a Fenix 5 Plus but a 5X should work as well. A mobile device with internet and file system access. I use an iPad Mini 4 and an iPhone XS interchangeably – other devices / operating systems are available. A GPX file containing a route or a track. You can either create this yourself on the device using an app, or download somebody else’s routes / tracks from the internet. In this example I’m going to use the excellent Footpath app. Note that the device does not need to have Garmin’s Connect app installed. 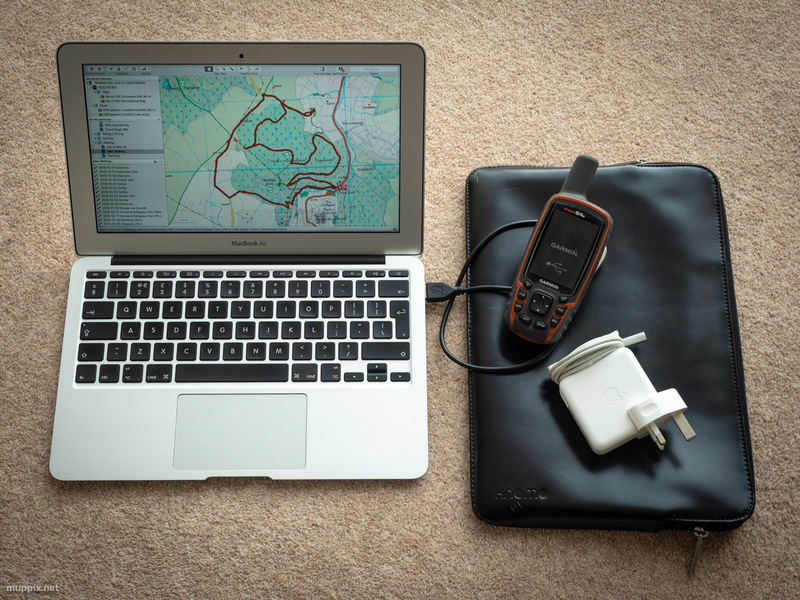 A way of getting the GPX data onto the device. I use an app called RouteCourse on the Garmin and its corresponding Dynamic Watch website on the mobile device. First off, I’m going to create a route that I want to run using Footpath – if you already have a GPX file containing a route you can skip straight to #3. This first step is as simple as starting the Footpath app, selecting a mapping style which shows trails and paths in addition to roads, and choosing ‘running’ as a routing method. Click on the map to nominate a start point, then click further points to shape your route until you’ve covered the kind of distance that you’d like to cover. When you save the route you’ll get to see an elevation plot as well, so you know roughly what you’re in for. Head on over to http://dynamic.watch using your mobile device and create a free account. Download and install the RouteCourse app to your Garmin device, and start it up by selecting RouteCourse from the bottom of your activities list. When prompted, complete the installation by entering the code offered by the app into your mobile device at http://dynamic.watch/link. This connects the app on the device to the free account you just created, so that any routes / tracks you import into that account can be downloaded directly by the Garmin device. Import the route onto the Dynamic Watch website, either by uploading the GPX file you saved earlier or by importing a link to a publicly accessessible GPX file. 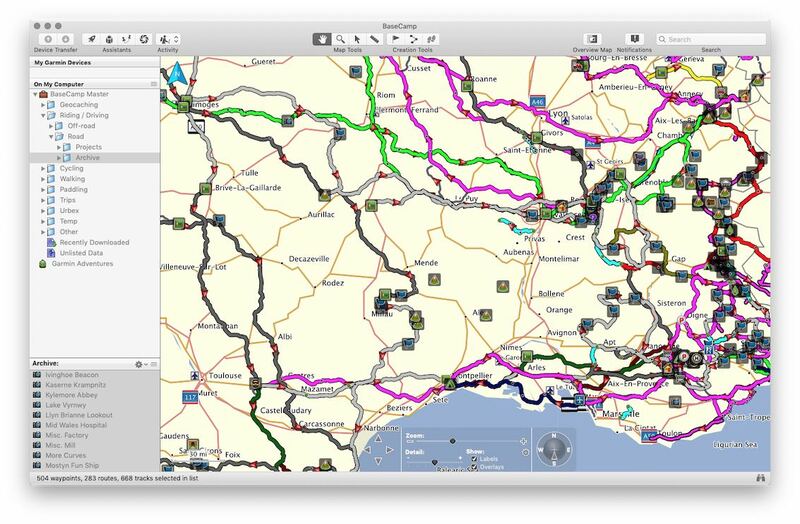 An overview screen will show an image of the route so that you can check it, and although other options are available at this stage (editing, renaming, exporting) these all require a Dynamic Watch premium account. On your Garmin device, start / refresh the RouteCourse app, which will now show the route(s) you uploaded to Dynamic Watch. When you highlight one in the list and press the ‘enter’ button you’re given the option of downloading & starting the route, or just downloading it. I tend to choose ‘download’ which saves the route as a course on the device, making it available via the ‘navigation’ sub-menu on most activities. Check the route on your Garmin, then go for that run / hike walk. There are a couple of gotchas to watch out for when you use this method to find somewhere to run or walk. First and foremost, not all of the paths / trails / roads that are shown on the map are necessarily available to you as a member of the public, and not all of those trails / paths / roads that are available to you are shown on the map. That’s a given with any mapping solution. Secondly, there are no turn-by-turn directions given, you are required to navigate by keeping an eye on the map screen and making sure that the little triangle representing your current position stays on the blue line representing your route. This isn’t too tricky in practice because the maps in the Garmin Fenix are pretty detailed, provided you’ve zoomed in far enough to show all the minor trails, but not far enough to make you think you’re off-course each time the GPS signal drifts a little. Help is available in the form of an off-course alert, which vibrates and buzzes when the Fenix thinks you’ve departed from the trail, at which point the ‘distance remaining’ readout at the bottom of the map screen changes to ‘distance to trail’. The only real annoyance caused by lack of directions is when your route / track crosses the same path more than once, like at a junction. In this case all you see are four or more blue lines converging in front of you, with no indication as to which one you should take. By the time the off-course buzzer sounds to alert you of an incorrect decision (or is it GPS drift again?) you’ve probably run 200 meters and dropped 50 in altitude, the recovery of which can be annoying. Please Garmin, sort it out. Finally, the routes / tracks that are exported today from Footpath don’t contain elevation data, so your Garmin device won’t be able to make use of any advanced features which rely on elevation, like Climb Pro. The makers of Footpath, Half Mile Labs, are aware of this and have already addressed the issue in their latest beta, so this minor pain point shouldn’t be around for long.